It is unknown from where this monster originated, it is currently only traded among secretive groups. If there were ever a truly domesticated Monster, it would be Meerlin. They require no formal pact and even enjoy the companionship of their owner. It could be argued that Tamers owning only Meerlin are not tamers at all! Meerlin will stick close to their owner, quickly scurrying around their neck, up and down their leg, arm etc. disappearing into pockets or sleeves. In an instant, they'll re-eappear from a totally disconnected sleeve or pocket and continue their roaming. They teleport from place to place seemingly effortlessly. 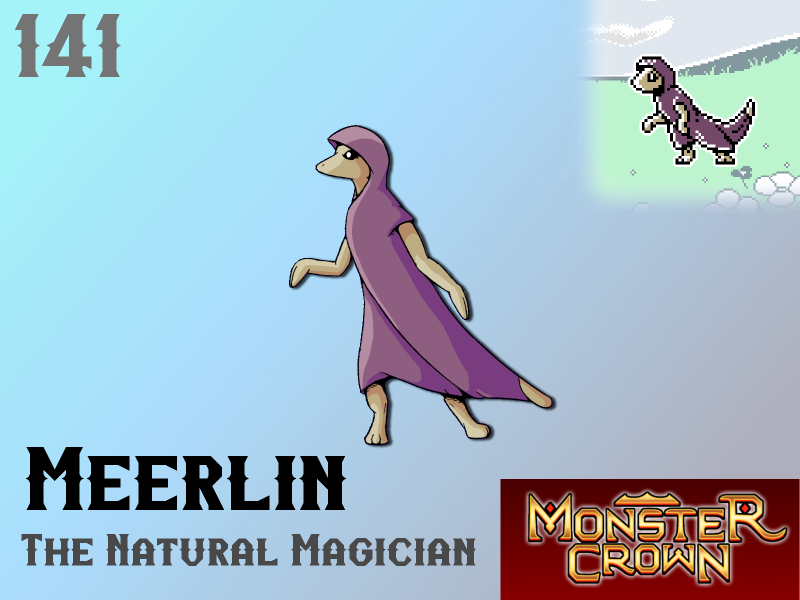 Their casual magic use and harmless stature has made them amusingly whimsical and popular amongst the wealthy, well-connected individuals that call a Meerlin their own. It is theorized that this Monster would have no equal in magical warfare if it could ever be inspired to show more than disinterest at the prospect of battle. Will Meerlin make your team? Aww... so cute, & chill! If I can trust this dude to be loyal, he/she's totally welcome in my Team! Bonus Points if they can nimble around with their tiny stature & Teleportation so easily it looks like Magic Matrix Moves!